How to view history on Internet Explorer 10/9/8/7? Want to search the useful site that you visited before? Want to view history on Internet Explorer or to see what sites have been visited recently on your computer? This guide will show you how to view history on Internet Explorer 10/9/8/7. You can view history on Internet Explorer using features available on Internet Explorer browser. It is free, simple. There're two solutions for you to view IE history. Just follow the below steps to view the history on Internet Explorer. Open Internet Explorer on your computer and Click the Favorites button, and then click the History tab. Click the site you want to visit. 1. The history listing can be sorted by date, site name, most frequently visited, or most recently visited by clicking the list that appears under the History tab. 2. You can use the shortcut keys "Ctrl" and "H" to open the History tab. You can also view Internet Explorer history of all users directly from History Folder on your computer. 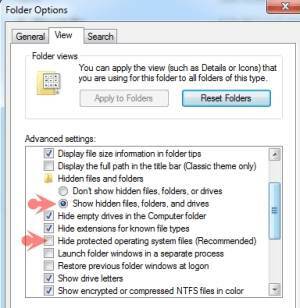 Step 1 First of all, you need to enable "Show hidden files, folders and drives" and disable "Hide protected operationg system files" in Folder Options. Step 2 Then you need to go to below location in C: drive with File Explorer on your computer. Step 3 Then your IE history will be displayed in "Date", and you can tap the date to view details of your IE history. Tips You can also set files to be hidden after checking IE history by following Step 1. Your Internet history is not necessarily the most reliable way to search the sites you visited before, or the sites that your kids or employees visited. Because if you deleted the sites from the history or deleted the cookies, the sites you need or the sites they visited will not be displayed.